BA (Hons) Illustration graduate, Sonny Ross, has made his mark on online history, as his illustration was chosen to be a Google Doodle. The images at the top of the Google homepage are known as Google Doodle’s and change to acknowledge a special day. 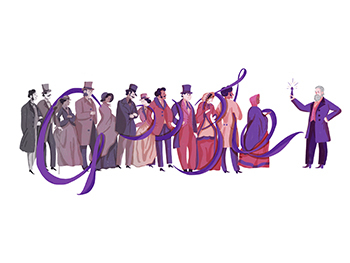 Sonny’s image was designed to celebrate the 180th birthday of Sir William Henry Perkin, who as an 18 year old laboratory assistant, accidentally discovered the first synthetic purple dye. “I wanted my illustration to focus on the people whose lives were changed with this invention and how it democratised fashion and textiles. This vision was demonstrated through the crowd with a colour shift from grey to purple.” Sonny told us. Hundreds of requests for doodle proposals get sent through to Google daily, so Sonny’s networking skills certainly paid off as he made connections with a Google Art Director through Twitter, which later lead to his work being selected. Since his graduation in 2014, Sonny has been involved in a number of interesting projects, including publishing his own book ‘Duck gets a job’, creating a number of lifestyle illustrations, magazine entries and illustrations for several newspapers, both national and in the USA. Sonny told us a little more about his time here at the School of Visual Communication and how it helped with his career choices. He also had some great advice to students who are thinking about studying illustration in the future. “You may be having doubts about higher education and already be good at what you do but there is always room for improvement. You may even surprise yourself with what you end up doing and find a new passion. I personally would not be a full time professional illustrator without going to university, it opened my eyes and inspired me to aim high”. You can follow Sonny and see his work here. Image courtesy of Sonny Ross and Google.